Incisional hernia (IH) is a common and morbid complication after abdominal surgery (AS). However, there is a paucity of readily available, surgeon-facing tools capable of predicting IH occurrence. We aim to identify procedure-specific risk factors independently associated with IH and build a decision-support interface surgeons can utilized at the point-of-care. costs were assessed. Procedure-specific predictive models were generated using regression analysis and corroborated using a validation group. Operative IH occurred in 3.8%(N=1,127) of patients at an average follow-up of 57.9 months. Combined cost of care for patients experiencing IH was $62 million. All variables were weighted according to ß-coefficients generating 8 surgery-specific predictive models for IH occurrence, all of which demonstrated excellent risk discrimination(C-statistic=0.76–0.89). IH occurred most frequently after colorectal (7.7%) and vascular (5.2%) surgery and the most common occurring risk factors increasing the likelihood of developing IH were history of AS and smoking. An integrated, surgeon-facing risk prediction instrument was created in an App for pre-operative estimation of hernia after AS. Using a bioinformatics approach, we identified risk factors predictive of IH and created eight unique surgery-specific models. 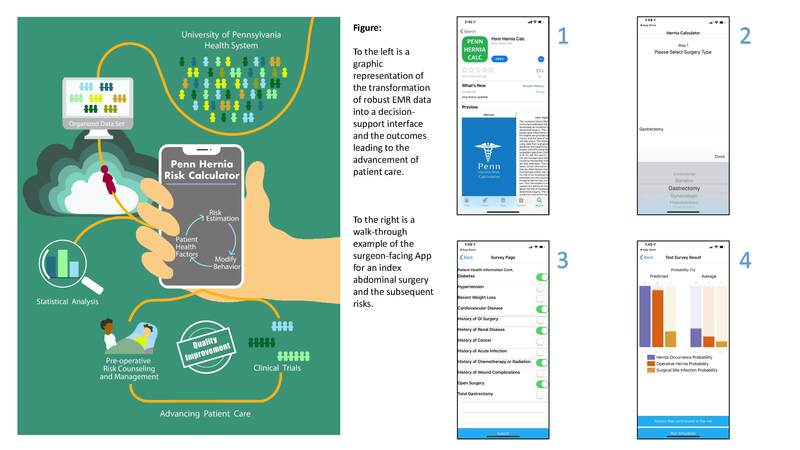 The models have led to a fully designed and unifying point-of-care risk calculator App generated from a multi-year, longitudinal, multi-hospital dataset.